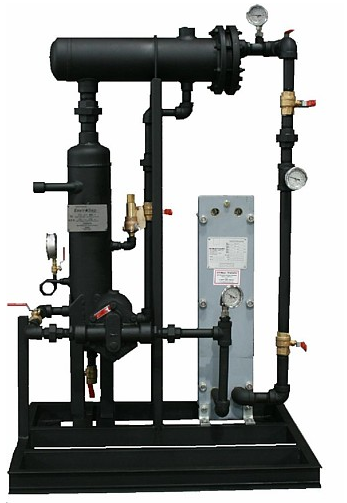 The envirosep FSHR, Flash Steam Heat Recovery Unit is an engineered package designed to facilitate heat recovery from flash steam, condensate, or both. 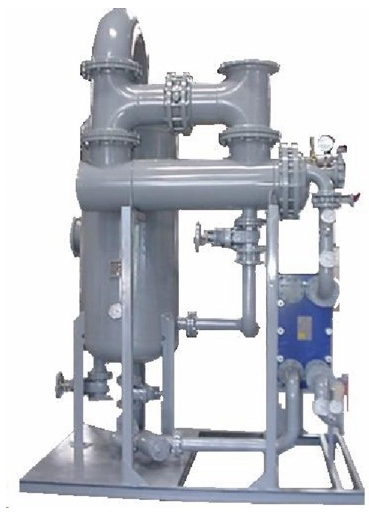 The FSHR is ideally suited for heating continuous flow of fluid, such as make-up water to a boiler feedwater system. The atmospherically vented unit helps recovery and utilize valuable heat generally lost during boiler blowdown. A shell and tube recovery module with U-tube configuration is used for recovering energy from the flash steam, while the condensate utilizes an efficient plate and frame recovery module. Non-continuous flow applications may require additional recirculation and/or relief valves. An optional make-up water control valve may be installed upstream of the unit in order for the make-up to be allowed to thermally expand to atmosphere to prevent system damage. All systems are fabricated and welded per ASME Section IX Codes and Standards.